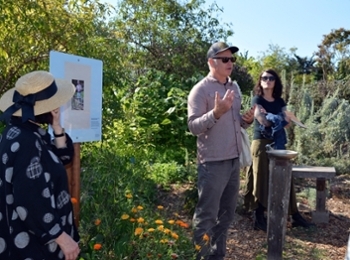 Harrell Fletcher describes one of the Collective Museum installations at the UCSC Farm. 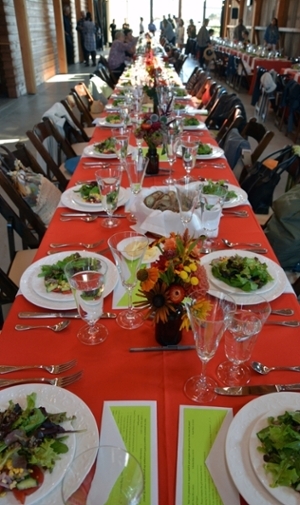 Tables are set for dinner in the newly restored Cowell Ranch Hay Barn. More than 125 guests joined us for this summer’s Sixth Annual Farm to Fork benefit dinner. Founded by Matthew Raiford, a member of the 2011 Apprenticeship in Ecological Horticulture and a professional chef, the dinner raises funds to provide Apprenticeship scholarships and other program support for the Center for Agroecology & Sustainable Food Systems (CASFS). Guests were welcomed with a reception in the farm fields overlooking Monterey Bay and enjoyed tours of the 30-acre organic farm led by CASFS staff. Harrell Fletcher, a 1996 graduate of the Apprenticeship, also led a tour of several of the Collective Museum installations located on the farm. Now a professor of art and social practice at Portland State University, Fletcher and his colleagues created the Collective Museum exhibit that features 50 interpretive installations spread across the UCSC campus. Following the reception, guests strolled down the hill to the Cowell Ranch Hay Barn to enjoy an al fresco wine, hard cider, and cheese tasting hosted by local vintners Randall Grahm of Bonny Doon Vineyard, Michael Martella of Martella Wines, Anne Krolczyk of Fogarty Winery, and Aaron Storrs of Storrs Winery & Vineyards, with cheeses donated by Staff of Life. The event then moved indoors to the beautifully restored Hay Barn, where guests seated themselves at long tables decorated with sprightly flower bouquets created by Farm & Garden apprentices and staff. Diners enjoyed course after burgeoning course of a wonderful organic meal created by Feel Good Foods’ Heidi Schlecht and Amy Padilla (also an Apprenticeship graduate) and featuring donations from Pescadero’s Tom Kat Ranch and produce from the UCSC Farm & Garden. CASFS executive director Daniel Press welcomed the guests and spoke passionately about the dedication, vision, and love of the staff, students, and many supporters who have developed and sustained the Farm & Garden over the course of fifty years in its work to train new organic farmers and gardeners and create a healthier, more just food system. Current Apprenticeship class member Leigh Gaymon-Jones reflected on the excitement of learning new skills to share with others following graduation, and Harrell Fletcher shared the ways that the Apprenticeship and its emphasis on the importance of place and collaboration influenced his current work as an artist. The benefit dinner raised more than $50,000 to support the 2017 Apprenticeship class and purchase a much-needed new tractor. We are grateful to those who supported this year’s dinner, to the many who made donations, and to our in-kind sponsors: Bonny Doon Vineyard, Feel Good Foods, Martella Wines, Staff of Life, Storrs Winery and Vineyards, and Tom Kat Ranch. If you would like to support the Apprenticeship and the work of CASFS, please see the Support CASFS page.